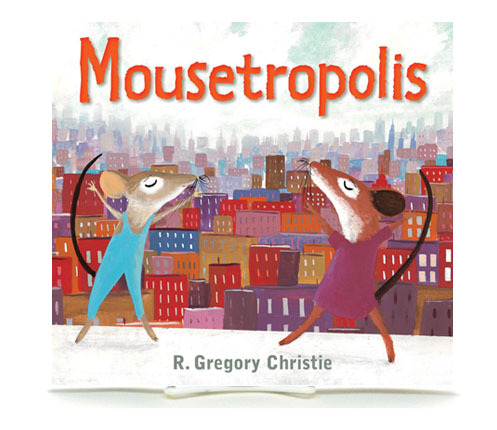 Let me re-introduce you to R. Gregory Christie along with his picture book, Mousetropolis. Christie visited the Brown Bookshelf during our 28 Days Later campaign on February 4, 2015. During that interview, I was struck by his phrase, “… artist who can alter the human form with an eloquence and rhythm.” I interpreted artist as writers and well as illustrators and applied it to mice. It’s very appropriate for his updated and unique version of an Aesop fable. Mousetropolis is both eloquent and rhythmic. The concept of writing as well as illustrating his own work intrigued me. I asked Christie to share his experience with the Brown Bookshelf’s readers and he accepted my invitation despite his super busy schedule. Is Mousetropolis your first author/illustrator project? Yes and I was really happy to have the fine folks at Holiday House Books patiently support this new territory for me, it’s really an amazing company. It’s the first American publishing house to solely publish books for children and I’m honored to be a part of their list. Did it feel odd to illustrate your writing? Absolutely! As I child I would spend hours developing as a visual artist. Once I felt proficient with sketching I focused on tonal drawings, as that developed I moved on to pen and ink and eventually paints. On and on, decades of study that kept me up many nights. I loved growing creatively because it built my self-esteem and helped me to connect to people. For most of my life, I never personally considered words as my medium and looking back I must say that my focus on the visual arts was pretty absolute. So even after years of people telling me that I should write books, figuring out Mousetropolis’ written voice was a terror. I got over it by stepping outside of my own head and giving what was written a visual voice (and vice versa). As you wrote, did you visualize the illustrations? No, it was wasn’t terribly difficult to illustrate right away because of it being a well-known story. So I really found the project’s written voice during the sketch phase. Additionally I’m not such a fan of doing anything in a linear way, so the two grew in tandem. However, I did have to visualize the main characters. Initially I was thinking of a style based on Mars Blackmon for the city mouse (Spike Lee’s fictional character in the film “She’s Gotta Have It”). I was going to do a mouse with 1980’s Gazelles and a cap turned to the side and then decided to go another route. I was concerned about stereotypes, worried that I’d be insulting aspects of American culture and regions by being too heavy handed with clichés. So I left out the straw hats, “gold grillz” or bucked teeth chomping on straw but kept the overalls and oversize tee shirts. What obstacles did you encounter? I was respectful of representations from both regions and the biggest change was from a night time city view with many lights into a multitude of brownstones and two story buildings when the mice first see the city. Another big change comes from an equal opportunity conversation. One of my interns from, the autographed children’s book store and art school, GAS-ART GIFTS, that I run in Decatur, Georgia, stated ‘How come there are no girl mice”?! I figured that the mice could be whichever gender the reader’s heart desired but that didn’t seem to fly. So if you look for it you’ll see a purple miniskirt wearing mouse with a pink purse and striped tights, that was something I never saw coming but, there you go—gender equality. How would you describe the art medium? It’s acrylic gouache, an opaque acrylic watercolor that has the properties of both acrylic and gouache. It’s perfect for laying in tones, details and then drawing on top of them with lines. Congratulations! Mousetropolis is a wonderful book that will mesmerize children and inspire authors-illustrators. Thank you for sharing your creative process with the readers of The Brown Bookshelf. Christie’s latest projects are The Book Itch (November 2015)and Freedom in Congo Square (January 2016). Visit him on his website, gas-art.com. Nice Work. Looking forward to reading the book. Cool to hear about your process. And I like the fresh take on an old story. Have just put it on hold at our library. There are 20 more on order at the SFPL. Great exposure!